Hey guys, I'm actually not sure if this is counted as a bug but in my opinion it is. and then once it doesn't close I have to open my task manager just to close cubic castles, I kinda get tired of it. And as you know with steam it will say "Error, app already running" or so is. I'm also afraid it uses network when I'm not looking, although task manager says 0% network, but it says that for all apps. -Clicking the proper cubic castles close button, pressing F4 on my laptop, and also I try using tab+shift. The only one works is F4 which closes it completely. but I cant keep using it to close cubic castles. 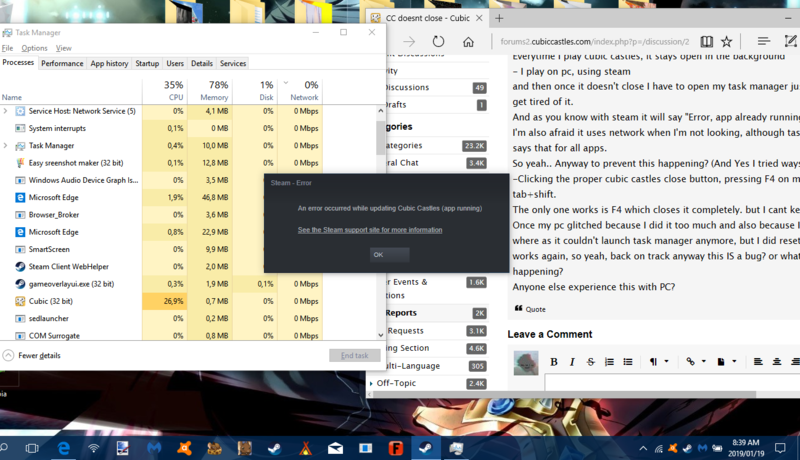 Once my pc glitched because I did it too much and also because I kept launching task manager where as it couldn't launch task manager anymore, but I did reset my pc, so now task manager works again, so yeah, back on track anyway this IS a bug? or what, and how to prevent this from happening? Anyone else experience this with PC? Also here is a little screenshot of it, and some unkown reason it says "updating"
but theres no required updates for cubic castles. You already open Task manager.. just End process.. Click the Cubic and End Process . What windows version is your laptop running? Lopaiko, you obviously weren't paying much attention... Please read my discussion's comments again and then tell me that, or actually I'll tell you now. I was showing you HOW it doesn't close for proof that IT DOES NOT CLOSE. And do you know how many times ive used taskmanager that it doesn't even open most of the time, sometimes it even crashes my pc. This also happend to me when my wifi lagging.. Check your ram and make sure it's not full. Do you have an anti virus software? ^^ Just uninstall CC, if Steam gets irritated then kill steam's process and try it again.